The loss I feel, I cannot describe. It’s like something I have never felt before. She was my spiritual queen mother and everything that that word implies. She was the ultimate teacher. She taught me the poetry of courage and respect. Maya Angelou is the greatest woman I have ever known. She was my anchor. So it’s hard to describe to you what it means when your anchor shifts. The first time I read “Phenomenal Woman”, I was struck by how she celebrated black women’s beauty like no one had ever dared to before. (Applause.) Our curves, our stride, our strength, our grace. Her words were clever and sassy; they were powerful and sexual and boastful. And in that one singular poem, Maya Angelou spoke to the essence of black women, but she also graced us with an anthem for all women –- a call for all of us to embrace our God-given beauty. Her message was very simple. She told us that our worth has nothing to do with what the world might say. Instead, she said, “Each of us comes from the creator trailing wisps of glory.” She reminded us that we must each find our own voice, decide our own value, and then announce it to the world with all the pride and joy that is our birthright as members of the human race. Dr. Angelou’s words sustained me on every step of my journey –- through lonely moments in ivy-covered classrooms and colorless skyscrapers; through blissful moments mothering two splendid baby girls; through long years on the campaign trail where, at times, my very womanhood was dissected and questioned. For me, that was the power of Maya Angelou’s words –- words so powerful that they carried a little black girl from the South Side of Chicago all the way to the White House. And today, as First Lady, whenever the term “authentic” is used to describe me, I take it as a tremendous compliment, because I know that I am following in the footsteps of great women like Maya Angelou. But really, I’m just a beginner — I am baby-authentic. 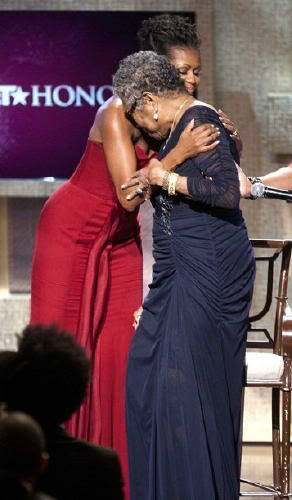 Maya Angelou, now she was the original, she was the master. For at a time when there were such stifling constraints on how black women could exist in the world, she serenely disregarded all the rules with fiercely passionate, unapologetic self. She was comfortable in every last inch of her glorious brown skin. But for Dr. Angelou, her own transition was never enough. You see, she didn’t just want to be phenomenal herself, she wanted all of us to be phenomenal right alongside her. So that’s what she did throughout her lifetime -– she gathered so many of us under her wing. I wish I was a daughter, but I was right under that wing sharing her wisdom, her genius, and her boundless love. She showed us that eventually, if we stayed true to who we are, then the world would embrace us. (Applause.) And she did this not just for black women, but for all women, for all human beings. She taught us all that it is okay to be your regular old self, whatever that is –- your poor self, your broken self, your brilliant, bold, phenomenal self. That was Maya Angelou’s reach. She touched me. She touched all of you. 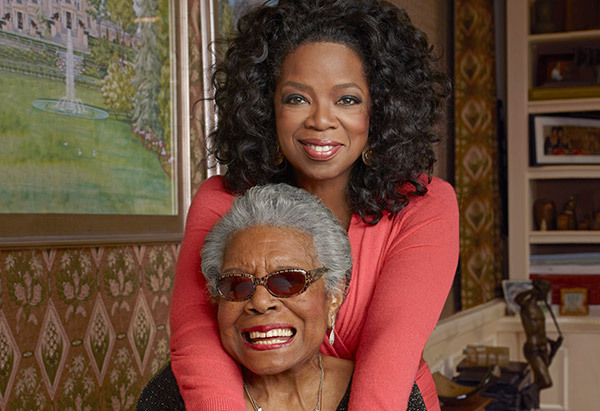 She touched people all across the globe, including a young white woman from Kansas who named her daughter after Maya, and raised her son to be the first black President of the United States. Editor’s Note: I was and am a Maya Angelou stan – someone once suggested I go on Mastermind and have Maya Angelou as my Specialised Subject, she was my Godmother in my head, I have read and own all her works and she allowed me to enter her space, to know her, to let her come into my space and be my literary teacher, a woman whom I admire and who encouraged me to write, to express my thoughts and my emotions with words.